For those of you who don’t know, roti aka chapati is an unleavened Indian flatbread. 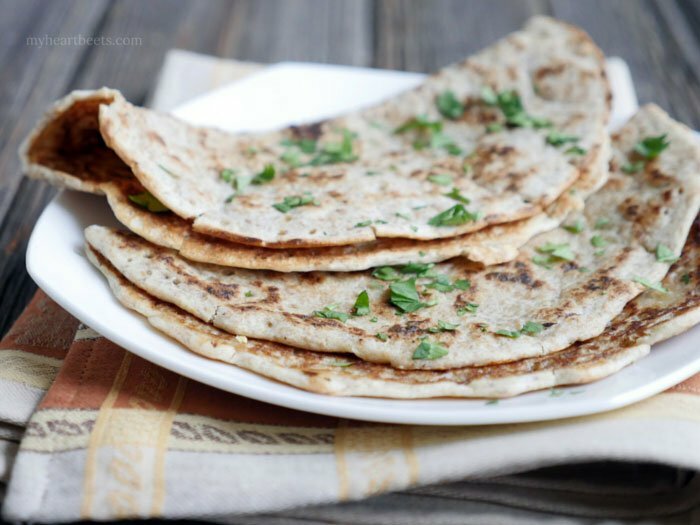 While naan is usually served in restaurants, roti is what most Indian families eat at home. It’s usually slathered in ghee and used to scoop up curries. I miss eating roti – I have so many great memories associated with it. As a kid, my favorite way to eat roti was to put an Indian spiced omelet on top and roll it up like a tortilla. This gluten-free flatbread hits the spot. It fills a strange void that roti left behind. 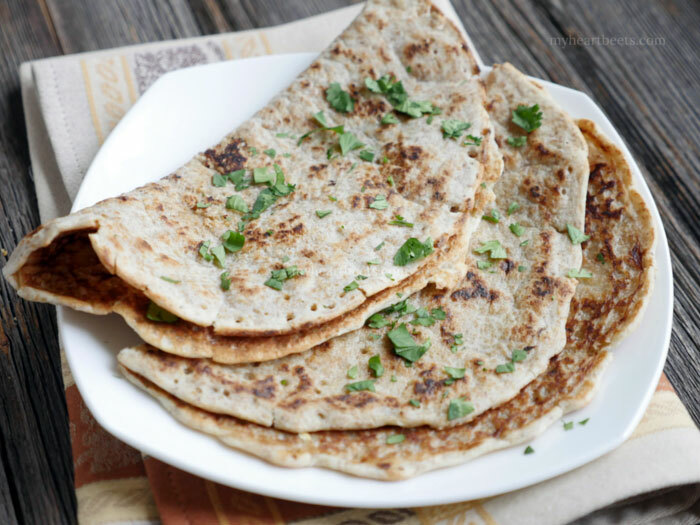 Like the paleo naan, this paleo roti is super easy to make – as easy as making pancakes! 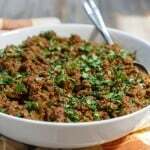 There are a few things you’ll need to know when using ground flaxseed meal though so be sure to read through the recipe and notes! 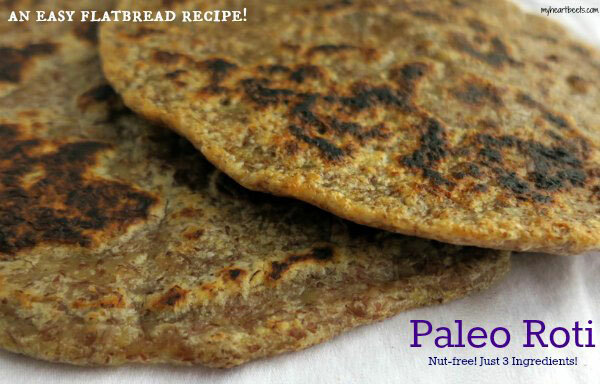 When it comes to this paleo roti, one thing is for sure – it’s awesome. 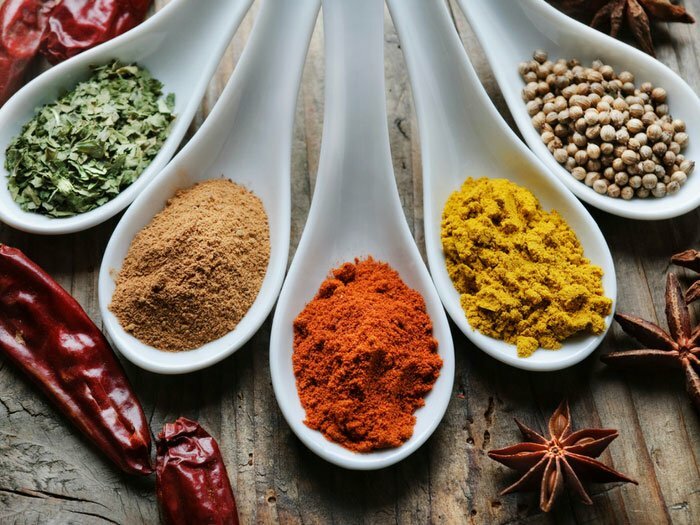 These three ingredients are just a starting point – have fun experimenting with spices and veggies. 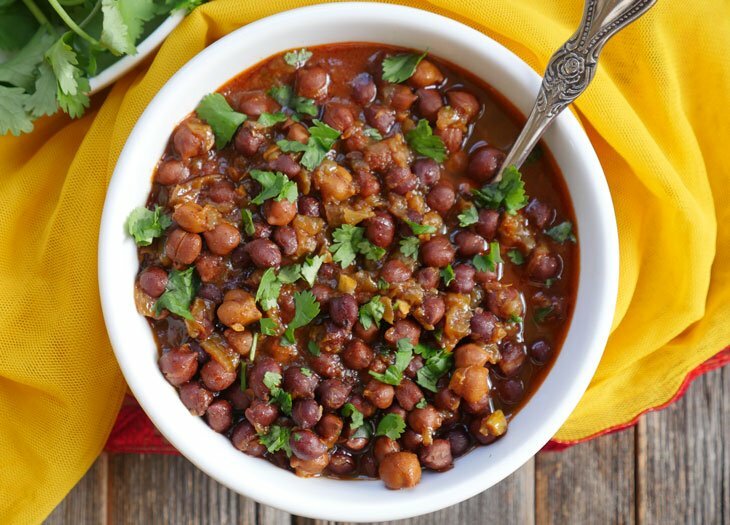 I am hopeful that this recipe will be interchangeable with my paleo naan – so that those who can’t have nuts will still be able to eat paleo samosas or paleo empanadas. I’ll update this post when I get around to experimenting! Until then, enjoy! Preheat a 9.5 inch (or larger) nonstick pan or steel crepe pan over medium heat. Mix all the ingredients together in a bowl, and pour half of the batter (a little less than 1 cup) onto the pan. Spread the batter out with a spoon. If the remaining batter becomes too thick, add more coconut milk to thin it out. Pour the remaining batter onto the pan and cook both sides until done. If the middle still seems slightly undercooked, place the rotis on a baking sheet and bake at 350°F for 10-15 minutes, or until done. You will notice that as the batter sits in your mixing bowl, it will become thicker. That’s because flaxseed meal soaks up moisture quickly. Feel free to thin out the batter by adding more coconut milk. You don’t have to do this – but if you don’t, just know that your second roti might be thicker than the first. While flaxseed is considered a paleo approved food, research on flax seeds varies. Some studies claim it’s a superfood and other studies suggest the opposite. 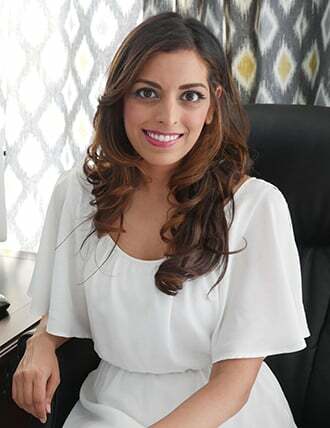 I’m not a scientist – I’m just a girl who tries her best to eat healthy – so please use google and decide what is best for you. Ground flaxseed can go rancid quickly. I store mine in the freezer and check it often to make sure it’s still good. Could I substitute almond milk instead since the flavor of the coconut milk comes through and my kids don’t really care for that? Mary, I haven’t tried using almond milk, but if you do please let me know how it turns out! I tried adding a bit of almond milk to the coconut milk batter, and I found it made the rotis crispier especially at the edges. The batter also thinned out a bit more and didn’t hold together quite as nicely in the pan. I’m not too crazy about the taste of flax. 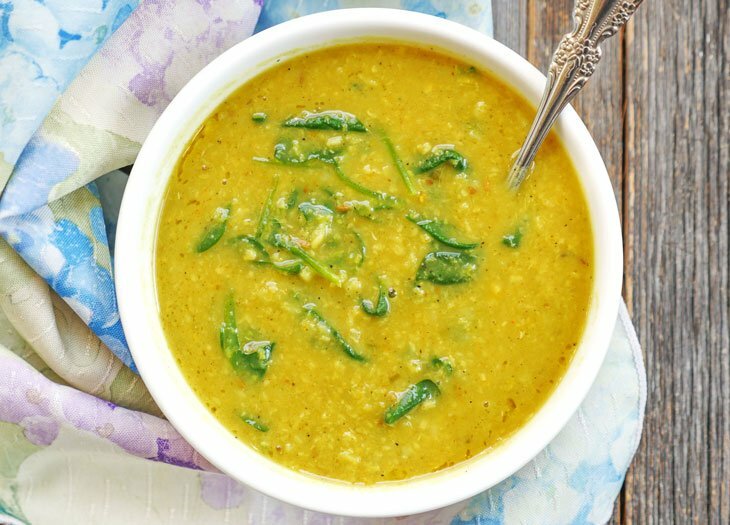 Can I use almond flour or coconut flour? What can I substitute for flax? I have a flax, almond, peanut, wheat food allergy. I haven’t tried it with this recipe, but in vegan baking we often use ground flax and ground chia seeds interchangeably. Tried the Naan recipe and while it was nice I thought something a little more “wholemeal” would be good. 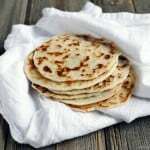 I was happy to see the roti recipe but as I am not fond of the flavor of flaxseed I replaced it with LSA (this is readily available in the health food section in Aussie supermarkets – an equal mix of linseed (what we call flaxseed), sunflower and almond meals). Worked perfectly! Will be back to “bread” with our curries from now on. Thank you for time in developing these recipes for us – most appreciated. It gets a bit tedious but I grind my own flax seeds these days due to the rancidity issue. Use my super clean coffee grinder. I look forward to trying this. Thanks. This is an amazing recipe! I had all of the ingredients on hand. Made one batch and my family loved them so much that I made another double batch! I will definitely be making these again. Thanks! Jessica, that’s awesome! I’m so happy your whole family loved the recipe!! Hi Alyssa, that’s awesome! 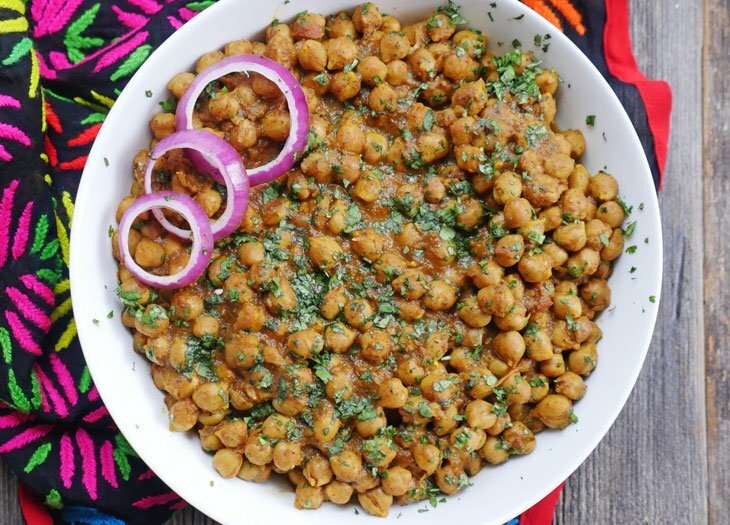 Let me know how you like the roti 🙂 I just checked out your blog – your recipes look delicious! Ashley, another winner. I kind of combined the naan and roti recipes, so added the flax to the naan, with garlic of course 🙂 turned out pretty amazing. On a side note, saw some of your wedding pics on Instagram, reminded me of my cousin’s wedding a few years back, she did both traditional and regular too! 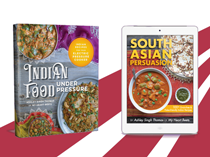 Thanks again for making delicious Indian recipes paleo! Man, those really look fantastic! I’ve been wanting to try a roti/chapati type of bread for Indian food. Thanks for this recipe. I’ll be trying it soon! Looks great! Do you think ground up sprouted chia seeds would work like the flax meal? Hi Lika, I tried it with ground up chia seeds and it didn’t work very well. I used 2 tbs ground chia seeds, 2 tbs tapioca and 2/3 cup coconut milk and it took me about 30 minutes to fully cook the bread. It ended up being crispy and tasty but took a lot of time. I’ll keep playing with the recipe and if I can make one work easily, I’ll post it. Thanks for reading my blog! Hi Ashley, recently saw your naan recipes and I was wondering if you came up with nut-free naan recipe too….and here it is!! Can’t believe its Nut-free and Egg-free, which is so hard to come by with paleo diet. so happy and excited to try it tonight as my son has Gluten, Egg and Nut-allergy. 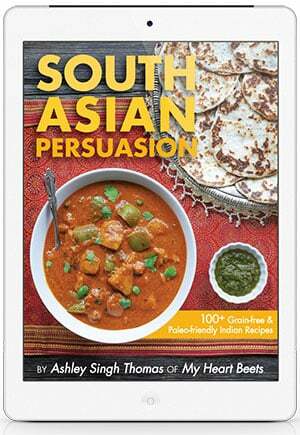 Girl, I tell ya I miss my rotis… so Thanks so much for sharing your recipes!! 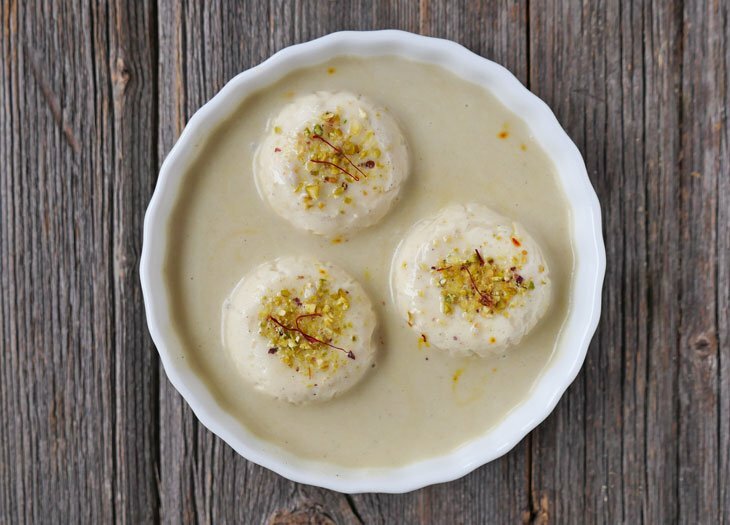 I was also wondering where the ghee was used in this recipe? did you just use to slather the roti in the end? That’s great – I’m so glad you found this recipe! I hope your son enjoys it 🙂 As for the ghee, I just used it to slather on top. Enjoy! Wow! Followed the directions and what a mess! Added at least 3 x the liquid and it was still very thick. Once in the pan it stuck instantly and would not cook. Tried frying in oil with no luck. I cook a lot and cannot imagine how this recipe would work…nothing like chucking 10 bux worth of paleo ing. In the trash. Very disapointed with this recipe. Neil… the recipe definitely works – not sure what went wrong but if you want to provide more details I can help you troubleshoot. If you’re having to add 3x the liquid then something is definitely off though. With allergies to almonds and flax, would teff work well instead? Ashley, thanks so much for posting this. 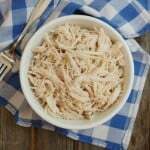 There are plenty of paleo “tortilla” recipes out there but nothing that resembles roti, and this is perfect! And without the heaviness of almond flour. I’m still trying to figure out the right cooking process. What I’m finding is that my batter is so STICKY that it doesn’t come off the ladle properly, and as it hits the pan it’s really hard to get it to spread at all. I did need to add a LOT more coconut milk as I went along. I might try even adding a bit of water next time. Does this happen at all with yours? Oh dear. I was just about to try these for my 13 year old daughter who has candida, excited that I could make a “bread” for her finally while she’s on a no grains, legumes or starches diet. But after I looked up tapioca and realized it was a starch, I’m sad I can’t make these for her. Any other ideas on what to use instead of tapioca? I’d love to try your naan first – almonds are on the okay list for us. 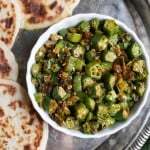 I’ve made these a couple of times because I can’t have the almond meal in the Naan recipe – I love the taste but every time I make them they come out still gummy in the centre. Do you have any tips of how to avoid this? I have cooked them on medium to low heat for long periods of time, but it seems no matter how much I cook them they are still ‘gummy.’ Thanks for any advice you can provide! And thanks for your great recipes! Hi Larissa, I’m sorry for the super late reply! If they are still turning out gummy in the middle, try baking them at 400 degrees for 10 minutes or so (keep an eye on them). If you try this, please let me know how it turns out for you! Brittany, thanks so much for the sweet comment!! 🙂 I SO appreciate it! SO looking forward to trying this recipe out! Will report back! Could I use water instead of coconut milk? I made this recipe and everything was smelling and looking great but they were still gooey inside. I cooked them on medium low and they were browned up perfectly but still wet on the inside? Is there a way to combat this? Hi Lex, if they’re still turning out gooey for you, I suggest cooking the bread for a longer period of time on lower heat. You can also put them in the oven at 400 degrees for 10 minutes for a crispy flatbread. Let me know how this works out for you! I would really love to see a video on this please . Just had to tell you that I’ve made these a bunch of times since finding them about two weeks ago. They’re crazy easy and the fam loves them! I’ve added S&P and cumin to them for a burrito type dish. We’ve also just had them plain with apples. And we’ve had them as the wrap for hamburgers and even greens. So good…you’re a rockstar for this! Thank you!! Sorry about your allergy, Paula! Let me know how this turns out for you! Any idea how many rotis these make please? Linda, this will make about 6 small rotis. Please let me know how the recipe turns out for you! I too used LSA ( linseed, sunflower and almond) and it worked really well. I do find these breads sweet ( the coconut I guess?) and my partner was fantasising about them with vanilla ice cream lol. But the toughest critics, the three kids, LOVED them! Made this with your butter chicken recipe but used 1/4 cup of almond and flax meal. They turned out great but I had to finish them in the oven so they weren’t sticky in the middle. I find this happens with arrowroot flour. Can I substitute the tapioca flour for either almond flour or coconut flour? I loved the idea of minimal ingredients, but I found the roti didn’t bend and fold like a true roti. I ate mine with Kofta and that’s where I noticed it’s stiffness. I can usually bend mine but I think it depends on how long you cook it. That said, it’s Paleo so unfortunately it’s not going to be exactly the same. This looks great. Unfortunately I have an allergy to Coconut Milk….any substitute for that? Hi Amit! The thing is that canned coconut milk is very thick and so replacing it with another type of milk might not give you the same consistency. I think it can be done but you’d need to adjust the proportions of all the ingredients. You can try adding the milk of your choice a little at a time until you have a pancake-like batter. I’ll try to work on a coconut-free flatbread recipe! Louise, probably because you’re making a double batch. In the recipe notes I write: “You will notice that as the batter sits in your mixing bowl, it will become thicker. That’s because flaxseed meal soaks up moisture quickly. Feel free to thin out the batter by adding more coconut milk. 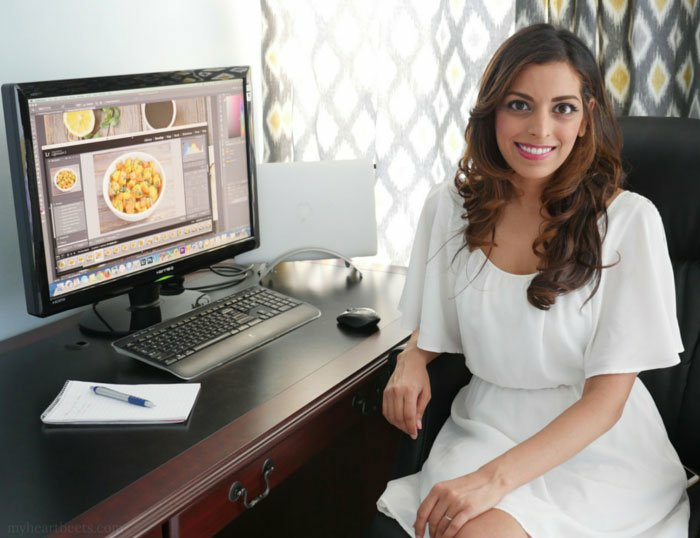 You don’t have to do this – but if you don’t, just know that your second roti might be thicker than the first.” Hopefully that will help if you decide to make this again! These are great, thanks. However, due to a long distraction I left them in the oven for too long and they became crisp (not burnt). I broke them up into pieces and they made the most delicious crackers. So much so, that I plan on making them like that again. Nice rotis too. Jane, that’s great to hear! I’ll have to try them as crackers sometime soon! Hi, I made this exactly how the recipe says, except that instead of frying it I put it in the oven at 400 degrees. It took forever to cook and it was sooooo oily!! I don’t know why……..all it had was the tapioca flour, ground flax seeds and the coconut milk. It finally cooked after an hour and a half and it was super super oily. Do you know what I might have done wrong? I baked it because I wanted to avoid frying it since I have a sensitive stomach and didn’t want to irritate it by frying. Hi Saira, so you poured the batter directly onto a baking sheet then? If that’s the case, it won’t work. This batter has to first be cooked in a pan. I hope that helps answer your question – and I hope you’ll make it again! So my dumb self made the first batch with one whole CAN of coconut milk…haha maybe that was why!! I’m making another one right now actually and it actually looks right lol 🙂 I’m finishing it in the oven. It’s a little oily though. Is that normal? Could it just be from the flaxseeds? But other than that I finally got the roti recipe right this time 🙂 Thank you!! awww I hope you love it, Ali!! Try my paleo naan and my coconut flour naan (that one is in my eBook) if you get a chance too! Hi !love ur recipes ..however for the naan ..I’m. Not able to source almond flour where I live (Africa!) Would it possible to substitue that with GF bread flour ? Or a combination if tapioca and rice flour/brown rice flour ? Nishma, try making my rice flour roti instead! Or you can read my Paleo Naan FAQ to get some substitution ideas. Looks so good, We cannot fo Tapioca flour, can you omit? Or do you have a grain free substitute? you can try arrowroot powder! Hello …I don’t get tapioca flour where I live. .. what else can I substitute for it. 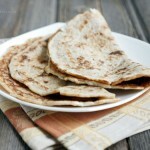 ..
Have you tried your paleo roti or naan with chickpea flour instead of tapioca. Or other binding agent? I ask from a glycemic index perspective. I have a chickpea flour flatbread recipe – I’ll get around to posting it soon! First want to thank you for the two recipes I have tried from you. 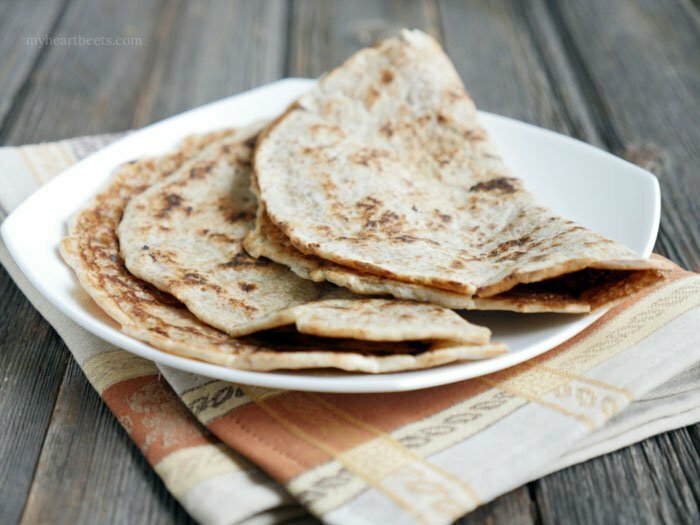 The paleo naan and the paleo roti… both so delicious without adding extra oils/ butters. I’m new to plant based/ trying to be vegan so it works. I just want to know how you keep the end result still white/ light in color? Is my heat too high? Or too much batter added while it’s cooking? I’m probably impatient, so rushing the cooking process , but not much more than you’ve suggested? Either way it’s delish, sometimes doughy or not. Any suggestions to make it look like ur pics? Can you use whole milk instead of coconut milk? I’m so excited to try this out!! I have many allergies so I’m excited but as I’m not paleo but the recipes often suit me would I be able to us GF flour? I made the batter and spread it in sheet pan lined with parchment. I baked it at 425 until it was set. I pulled it out of the oven and scored it into small squares, drizzled it with olive oil and sea salt, then placed it back in the oven until it was crisp. They were the most amazing crackers! We had guests for dinner who are still raving about them. Brilliant!! Thank you for sharing this with us! !